The Community Greenhouses are among the many delightful legacies of the Park. Part of the greenhouse complex, the Sarah T. Crosby Conservatory, houses a collection of plants from various parts of the world. It features a rainforest exhibit, a dry landscape and a beautiful exhibition of orchids lent by under-glass renters. 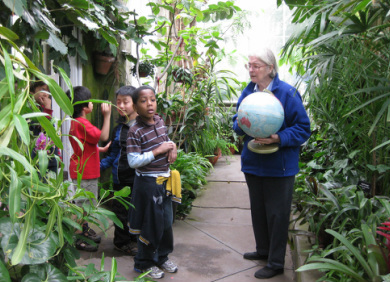 Our docents give 3rd through 6th graders and their teachers in the New Haven Public School system an introductory science and environmental tour of the Conservatory. This includes rainforest plants, desert plants and a collection of tropical plants that provide food and products we use. We discuss the structure and needs of plants with the children. Each child has a hands-on experience learning to pot a plant and then take it home to practice horticulture. We provide a rainforest activities booklet to each teacher as a follow-up to reinforce what the children have learned in their visit to the conservatory. Thanks to a Foundation grant that finances materials for tours, there is no charge for New Haven Schools. The Conservatory is wheelchair accessible. Please request a date from Kyle Holton at holtoncrew@gmail.com. Then request a bus immediately. When confirmed let Kyle know so docents are scheduled for your day. Tours last from 10 A.M. to 11:15 or 11:30 depending on your schedule. G.R.O.W.E.R.S, a horticultural program for handicapped adults, was established by Scott Hickman. The workers receive training in horticultural skills and raise and sell plants in one wing of the greenhouses. 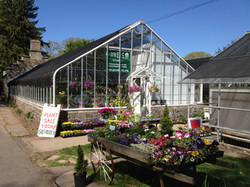 The entrance to the Edgerton Greenhouses is located just off Whitney Avenue on Cliff Street at the Hamden-New Haven line. A school group learning about plants in the Greenhouse.